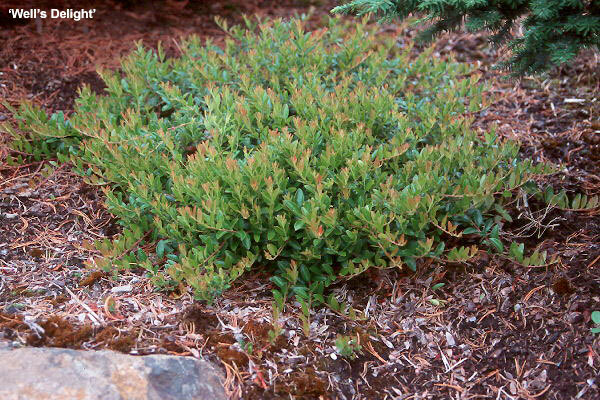 Evergreen shrub, procumbent, shoots to 2 ft (60 cm). Leaves alternate, simple, oval-elliptic to rounded, 8-15 mm, finely serrate, dark green above, paler below, thick. Flower urn-shaped, red in bud, then pink and white, in somewhat pendulous clusters. Fruit globose, 3-4 mm, purple-black. Sun to part shade. Prefers moist, well-drained, acidic soils. Hardy to USDA Zone 7 Native to North Carolina and Georgia. 'Bloodstone' - a selection of V. crassifolium subsp. sempervirens from a native stand in North Carolina, very low growing, to 5-8 inches (12-20 cm) high, indefinitely spreading, dark green, somewhat glossy, reddish in winter. Needs a well-drained site. 'Wells Delight' - selected from a native stand in North Carolina, very low growing, to 5-8 inches (12-20 cm) high, branches trailing or low arching, leaves glossy dark green, slightly reddish in winter, fruit black to purplish black. The Oregon Garden, Silverton: Conifer Garden.